Lincoln artist Matthew Sontheimer is something of a contrarian. As an Associate Professor of Art at the University of Nebraska at Lincoln, Sontheimer once told the Kearney Hub newspaper, “Everything I tell my drawing students to do, it’s what I don’t do in my work.” This from an interview in response to his MONA solo exhibit nearly a year ago. And, in a commercial environment driven by social media and the likes of Linkedin, Sontheimer admits he doesn’t even have a website. That’s right…I still don’t have a website is more than an anthem. It’s the title of his next solo exhibited at The Union for Contemporary Art opening March 9, 6-9 p.m.
Sontheimer’s maze-like drawings and photographs explore how we access, process, adapt to, ignore, and otherwise live with information. 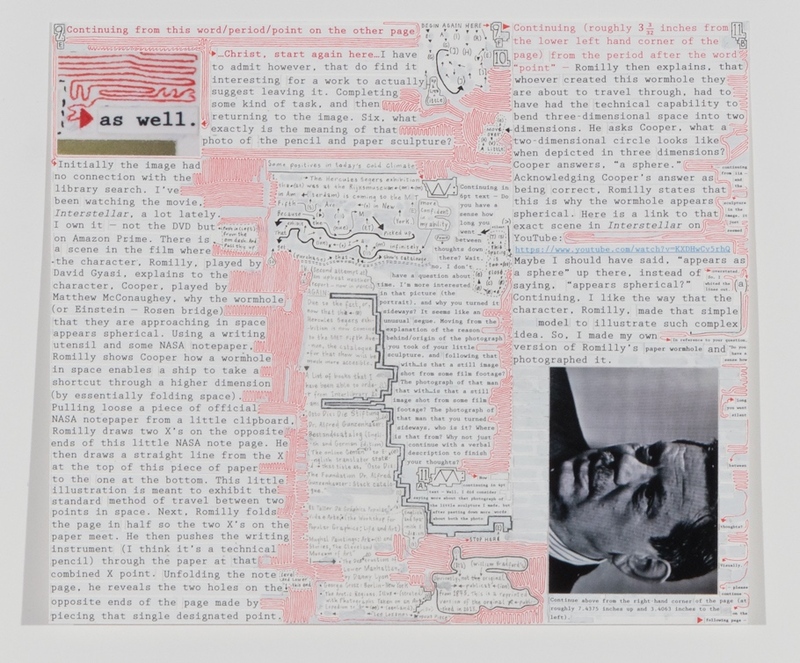 Text-centric compositions follow the artist’s internal dialogue, presented as an ongoing conversation between two fictional characters. Expressing the sometimes discordant speeds of thinking and making, Sontheimer’s works are filled with revisions, sidebars, and tangents that provide a wry running commentary about his own process. In short, rather than employing conventional methods, socially or artistically, the artist wants to connect with his audience with his richly dense art…up close. “I am very interested in intimacy,” he said during an artist reception at the Museum of Nebraska Art. “I want the viewer to get right on top of the work to read it.” And in the “process,” avoid the superficial, the ordinary. Over the course of Matthew Sontheimer’s exhibition which continues through April 14, U-CA will hold an ongoing public discourse its calling Flagging Conversations in multiple formats, seeking how queries and responses can help one understand community more intimately. To keep this dialogue visible, questions and answers both posed and provided by the community will be stitched into flags and displayed at The Union later this spring. That’s right…I still don’t have a website, opens March 9, 6-9 p.m. and continues through April 14 at the Union for Contemporary Art, 2423 N. 24th St. Visit u-ca.org for more info and gallery hours.